The clients in this project were thirty thesis students at OCAD University, and they have requested a catalogue that would showcase the work that they have produced in their final year. The program consists of a small number of students, making it a close clique of students and the tools they use are deeply integrated in the production of their work. Partnering up with fellow Graphic Designer, Michelle Liando, we wanted to create a cover that represents the community and hands-on aspect of their thesis program. 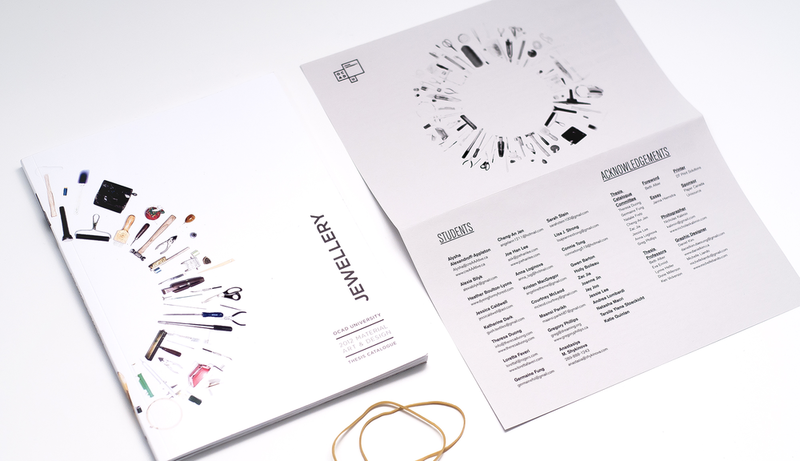 The objective was to produce a catalogue that showcase the work of thesis students within both the Jewellery and Fibre department. The challenge was to design a catalogue that organized each department into separate sections of the book but still retain a sense of unity without one department being more prominent than the other. Our approach was to produce a recto-verso book where it begins on either side depending on the department of study and in the middle of the book is the foreword and essay that is on a different stock, bound by an elastic band.